Now add something entirely unexpected. A two-metre-high barrelling wave that starts at the centre of the lagoon, peels perfectly for more than 150 metres, and dissipates softly as it hits the shore. 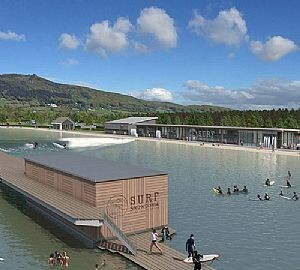 The unique concept behind Surf Snowdonia’s lagoon has been developed over the last ten years by Wavegarden, a group of engineers who also happen to be passionate surfers. Based in northern Spain, Wavegarden is the global leader in the design and manufacture of wave generation systems. But the awe-inspiring Wavegarden isn’t the only reason to come to Surf Snowdonia Adventure Park. You’re going to love our totally addictive Crash & Splash water-based obstacle lagoon – and ‘blobbing’ – as well as the surf-side café bar, coffee shops and retail space. And a 50-metre glass-fronted viewing gallery will let you get right up close to the surf action without even getting wet! The Surf Snowdonia Adventure Park Crash & Splash Lagoon is your opportunity to push your agility, balance and determination to the limits… and you’d better prepare yourself for some spectacular splashdowns! The watery assault course will see you grapple with giant spinning balls, monkey bars, climbing walls, balance beams and rope bridges – and it’s not as easy as it looks! But we promise you it’s even more fun. You’ll finish the challenge by flying through the air courtesy of the spectacular catapult ‘blob’ – possibly the most fun you’re ever going to have being thrown into water. The Crash & Splash is the ideal activity for a group of friends, family or colleagues. See who can get around the course quickest!